Previously (see here and here), we examined Joseph Smith's vision of a kingdom of God he hoped to see instituted on the earth in his day. I had intended to conclude this week with an investigation into how and why that dream failed to materialize, but instead I'll address concerns that have come in from readers who wondered about seeming inconsistencies between scriptural accounts of the kingdom of God, and the information we have about the efforts of the Council of Fifty to institute it in modern times. So it looks like this series will have a fourth part, to conclude (hopefully) early next month. I am far from an expert on this topic. I''m not going to be able to answer every question I've been asked because I don't know all the answers. I haven't absorbed everything I've read on my first go-round, and indeed I haven't yet read everything there is. So please take what I offer below as my opinion based on what little I've gleaned about this business so far. Let's remember that although we now have access to more information on this episode in our history than we did previously, the minutes of the Council did not always record all of Joseph Smith's instructions on the subject. We simply don't know everything he taught about it. The most reliable artifacts we have are the minutes taken during the actual meetings, but at times the scribe recording the minutes would simply tell us something to the effect that "Joseph then lectured at length about the kingdom" and then completely leave out most of what the prophet had said on that occasion. It's maddening, yes, and to further complicate things, we don't have the original minutes. What we have are copies of the original minutes that were transferred into three blank copybooks in the handwriting of William Clayton (the original pages were burned), and Clayton has proven to be less than reliable. But at least we have some second-hand recollections by those in attendance. Unfortunately, most of those recollections weren't written down until much later. Often some forty years later. 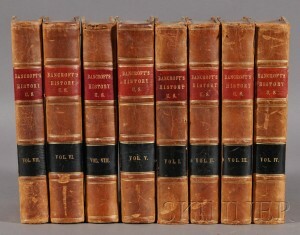 As I've documented previously, prior to the 20th century, even professional historians felt no obligation to present history accurately or objectively; George Bancroft, eminent author of the famous ten volume classic History of the United States, admitted to fabricating entire events when he felt such inclusions would serve to promote patriotism and good feelings in the reader. Mormons of the pioneer era were no different. Where we assume they have given us accurate accounts, too often those accounts have been changed, inflated, or embellished beyond recognition in order to make those accounts faith-promoting. Much of the history that has been handed down to us by our pioneer forebears is sometimes true, but often false. "...that you must not persecute your neighbors, but must mind your own business, and let your neighbors alone, and let them worship the sun, moon, a white dog, or anything else they please, being mindful that every knee has got to bow and every tongue confess. When you have paid this tribute to the Most High, who created you and preserves you, you may then go and worship what you please, or do what you please, if you do not infringe upon your neighbors." I think Brigham got it mostly right, but I believe his timing was off on that part where every knee shall bow and every tongue confess. That would happen eventually, upon the appearance of Jesus to the whole world. Then Everyone will recognize Him for who he claims to be and confess Him to be the Christ. But that event will take place sometime after the kingdom has been instituted. Brigham seems to believe that a confession of Christ would be the initial requirement for anyone wishing to live among the believers, but he's clearly wrong. The kingdom of God was to be a commonwealth or republic where anyone can live in harmony with everyone else prior to His second coming. There will be no requirement or confession of faith; only a willingness to respect the right of one's neighbor to the freedom of his own conscience. Brigham does not seem to notice the contradiction in his own words, when he says they must confess that Christ is the king, and then go off and worship a white dog or anything else. Why would everyone on the earth confess that Jesus is the Christ, yet still want to go home and worship something else? I'm pretty sure that's not how it's going to work. "If Jesus said 'The kingdom of God is within you' how could the kingdom be a physical location?" Jesus did say that (Luke 17:21). But why did he say it? At that time, both the religious and political orders dominant in Judea would certainly have been inimical to a system that relied upon voluntary cooperation between people (John 18:36). A system that relied on harmony and cooperation wouldn't be able to find purchase as long as the competing system of the Romans had a choke hold on the land. The true king was on the earth, yes, but his kingdom was not yet hence (John 18:36), though it was nigh at hand (Luke 19:11). Jesus indicated that the kingdom of God would come later, after he was gone (Luke 22:18), but that it was something to wait for, to look forward to at some future time (Luke 23:52). So what did Jesus mean when he said "the kingdom of God is within you? What Jesus meant was this: you're not going to find the kingdom of God anywhere in the present political or religious order, but if you want to find it, look within yourself. Find that divine essence that will allow you to have charity toward others. It is that integrity of being that defines the way the kingdom of God operates. You all have that divine essence within you. Dig deep enough and you will find that charitable essence. "Charity" means more than simply donating money to the poor. It is a state of heart and mind that enables you to set aside any desire to mold others into the kind of people you want them to be. Charity means you allow the other person to make his own mistakes, to stumble, fall, and pick themselves up again without you bossing them around and making them do things your way. In other words, you only have the privilege of ruling yourself; you are not permitted to rule over anyone else, even if you are convinced you could manage that other person's life better than they can. What you can do is be there to offer assistance, but most especially to do what you can to alleviate the other person's pain. That is being charitable; allowing the other person to make his own mistakes, while being there to help him up when he asks for it. Looking for the kingdom of God? The kingdom of God is within you. It grows out of your example and your willingness to be charitable. You cannot force it on anyone else. 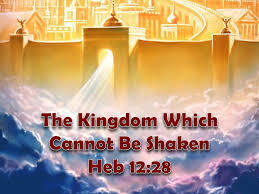 The kingdom of God cannot be imposed. That holds true today. If you want to operate on the same principles that heaven operates on, first look within and correct what isn't working in your own life. Or, as Dr. Jordan Peterson puts it, before you bravely march out to fix what's wrong with the world, start by cleaning up your room. "What about the description of the kingdom of God in 1st Nephi 15? That appears to be a place where no unclean thing can enter into. How is that consistent with the kingdom of heaven established through the Council of Fifty?" The element in all this that seems to cause confusion is that the scriptures often refer to two different kingdoms by the same or similar names. One is the kingdom where God dwells in heaven, the other is the kingdom of God on earth, which is the one Daniel spoke of in his interpretation of Nebuchadnezzar's dream. Generally, when the scriptures speak of the heavenly kingdom where God currently dwells, it's referred to as "the kingdom of heaven," while "the kingdom of God" generally refers to the kingdom of God on earth. Generally, but not always. Another way of understanding this thing is that God and angels dwell in a heavenly kingdom that we should want to emulate to the best of our ability. We emulate that kingdom by governing ourselves in a way similar to the way the angels govern themselves in heaven. That is, government without compulsion. Obviously, Daniel's dream was not referring to the heavenly kingdom where God dwells, but to an earthly kingdom that would eventually supplant all other earthly systems of government. The reason it would supplant the earthly systems is simply because all earthly systems are flawed. Every system of government on earth, including the government of the United States, relies ultimately on coercion to enforce its will. The kingdom of God, on the other hand, is a voluntary system where the rights of others would be respected because the hearts of the participants would be without guile. Those who participate in that Godly system would be self-policing, which means they would restrain themselves from imposing their will on others. No outside force would be required to restrain them. Those unable to act with charity toward others would not be happy there, and would ultimately select out on their own. They would leave, because those inclined to rule over others would have difficulty finding subjects. No one would be inclined to follow them. "Where is the revelation given to Joseph Smith commanding him to begin laying the foundation for the kingdom of heaven?" I don't know. Or I suppose I should say I don't remember where it is. I could wade through the minutes again and try to find it, but frankly, I think that's irrelevant. The Lord revealed His will to the entire Council, not through one particular person. It's not easy for us to grasp the concept of revelation to the many, as we have been taught that the Lord reveals His will to the Church only through his appointed prophet. We deserve to revise our thinking on this. Here is the important thing to know about the Council of Fifty: Joseph Smith did not govern this body. He did not direct it. His role was to gather these men together, teach them what they needed to know, and then lay it all on their shoulders and step back. He never intended to do anything other than, in his words, "lay the foundation." As we shall see in the next installment, Joseph Smith never intended to have anything more to do with the kingdom past the time he got these guys to take it upon themselves. Members of the council received revelation constantly regarding their duties and responsibilities. They report having experiences that brought them closer to God than ever before. They knew absolutely that they were involved in an unprecedented undertaking and that this was the work the Lord had always intended for them to do, this was the entire reason for the Restoration in the first place, it was to be the Lord's Magnum Opus for the last days. It should not surprise us to learn that His spirit was ever present in these proceedings and among these men. It was actually a revelation from God directly to the body that gave the Council its long-form name. That name includes their having the right to govern through revelation. Here again is that name: "The Kingdom of God and His Laws, With the Keys and Power Thereof, and Judgement in the Hands of his Servants." Notice that last clause: judgment in the hands of His servants. That's their authority to receive revelation right there. No more than twelve meetings of the council took place during Joseph's lifetime, and these meetings all occurred inside of three months. Joseph wasn't needed to lead this council; these men knew their responsibilities. They were to lay the framework of the kingdom's limited government, explore possible locations outside the borders of the United States where they could set up their independent commonwealth; and after that, invite other freedom-minded families to join them there, similar to what had been formed in the Republic of Texas a decade before. Once a location had been selected and the Saints and other freedom lovers removed to it, the duties of the council would be simple: maintain contact with the king, Jesus Christ, through continuous revelation, assuring that no one who was domiciled within those boundaries attempted to impose his will on any other, or persecuted any others for their beliefs. That would have been pretty much the extent of the Council's police powers. It's also instructive to remember that once the kingdom was underway, the Council of Fifty would not become some permanent, hierarchical body ruling over the kingdom. Members of the council would serve under their fellow men and women, without pay, so there would be no advantage to making a career out of such service. Each man would continue holding down regular employment just as he was now, laboring for his own support after the model of King Benjamin in the Book of Mormon. There was no profit to be gained by sitting on the council, since it was all voluntary. Membership in the council was to remain fluid and ever-changing, with the hope that more of the LDS members would be replaced by non-members so the kingdom would not be perceived as an extension of the LDS church. In short, the Council was less a governing authority than a method for ensuring that no single person or group of persons tried to rise to positions of leadership in the kingdom. The Book of Mormon example of the wicked King Noah and his court of high priests was a stark reminder as to what can happen when a people allow some to rise to positions of authority. Such a society then ceases to be a community of equals. The council was to have one salient purpose for existing: to see that all the people were protected in their rights, none above another. "Far from breaking up and consuming all other kingdoms, this one looks like it's trying to break away from the rest of the world to become isolated from it. How could a society like the one proposed by the Council of Fifty possibly fulfill the prophecy of Daniel?" Let's look at why the Council was considering the newly formed Republic of Texas as their possible new home, and see how that land mass could have included the birthplace of the kingdom. In fact, let's go back further to the founding of the United States. The United States was not intended by its founders to ever evolve into one monolithic country governed by a central authority. Rather, the founders envisioned it to be a collection of separate countries, republics independent from one another and "united" only by certain principles held in common; they were not to be "united" as one single entity. The expectation was that if any state government became oppressive to its inhabitants, those inhabitants would have the option of removing themselves to a neighboring state where they could enjoy greater freedom and opportunity. The territory of Texas held that type of allure to a growing number of North Americans who were becoming convinced that none of the existing states in the U.S. held the opportunity to be truly free as did this area that was now completely free from of European control. The area we now know as Texas had for some time been claimed both by France and by Spain, with Spain ultimately prevailing against France and naming the area "New Spain." By the early 1800s however, as Napoleon recognized the futility of trying to hold onto the land France had long claimed for itself on the American continent, so too did the government of Spain realize it no longer made sense to fight to hold its possessions in New Spain. Texas was one of New Spain's least populated provinces, and not worth the bother. So Spain relinquished this territory to Mexico, and the faraway government of Mexico encouraged people from America and Europe to Migrate to Texas and settle, encouraging natives from the interior of Mexico get out there and do the same. There was plenty of room for everybody, and these three classes -Mexicans, Americans, and Europeans- had little trouble getting along in their new land. Some years later, the new president of Mexico, Santa Anna, decided to bring everyone in Texas under his control, resulting in all these settlers -former Mexicans, former Americans, and former Europeans- fighting off Santa Anna's army side by side. When the people living on the land prevailed, they established Texas as an independent republic answerable to no outside influence. Well, the sad ending to all of this is that eventually the Texans lost control of their republic when it was illegally annexed by the United States government and eventually converted into a state. But to get back to the question above, let's step back and consider what might have happened had Texas remained an independent Republic outside the United States. Well, we know what would have happened in Texas in a situation like that, because it had been happening for quite some time. Texas had come to be known as a place where people could come and live as free as they wished. American settlers from surrounding states like Tennessee, Mississippi, and Kentucky began pouring in, as did Mexican nationals from the far away interior of Mexico who also wanted to live life far from government interference. All the settlers, regardless of origin, flooded into Texas because they expected to do better there than where they had come from. Now suppose the Mormon expatriates had settled into some part of the wide open area of Texas and that area came to be known as a location where anyone would be welcome to join them so long as they respected the rights of every other person there? More constricting states in the U.S. would begin to empty out, as their citizens headed for greener pastures in Texas, expanding the kingdom of God. But more likely, those states, if they wanted to continue to thrive rather than to be abandoned, would be forced to convert themselves into a more accommodating environment, the kind of truly free, independent states Thomas Jefferson had envisioned them to become. The entire continent of America would have fulfilled its prophetic destiny as the shining beacon on a hill. There would not be just one free society existing in one corner of Texas, but numerous independent societies all over the land, and all thriving. The kingdom of God has no central governing authority, therefore there would be no limit to the number of communities, large and small, living under God's law all throughout the land. Nowhere would there be found a hierarchy or central government to muck it up. That is how the kingdom of God will break up and consume all other kingdoms; not by conquering the other kingdoms, but by subduing them. And how do you subdue a king? By removing his power, by providing his subjects with a better, alternative king more to their liking, a veritable King of Kings who tells them that they are free indeed. When given the opportunity, people will vote with their feet. A tyrannical king with no one left to oppress is a king who has been cut off at the knees; he has lost his power. He has been subdued by the beacon of liberty, which almost all people are attracted to. This is what started happening to the great kings of Europe near the end of the 19th century and the beginning of the 20th, who saw their subjects fleeing from them by the millions to resettle in America. Those kings had to learn to adapt or die; to convert their governments from monarchies into at least something resembling democratic republics. Many did, and even though the conversions aren't perfect or anywhere near complete, they are a start. Had the Council of Fifty not abandoned their charge to create the kingdom of God on earth back when they had the opportunity, the prophecy of Daniel would have been well underway by the time you and I arrived here on the planet. As things stand now, that prophecy has not yet been fulfilled. But the clock hasn't run out on us yet. "Why in the world would Joseph Smith crown himself king? The whole idea behind the kingdom of God was that Jesus Christ would be the king of His kingdom, is it not?" Joseph Smith was declared to be a king. Second and most importantly, we get to disabuse ourselves of our false notions regarding what makes a king a king. We have been too long exposed to the history of wicked kings who never deserved the title. A king is not supposed to be a ruler over other people, but a servant under them. Joseph Smith was declared a king in the same way King Benjamin was a king. 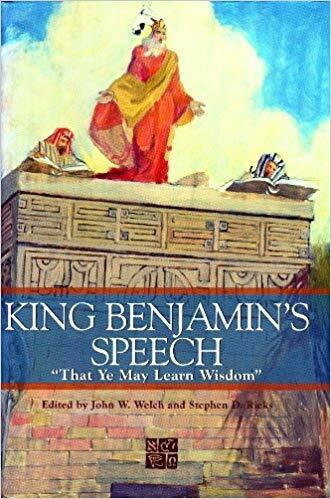 Let's look at what kind of king this guy Benjamin actually was, and see if we wouldn't like the idea of Joseph Smith being that kind of king. In Mosiah 2, we witness King Benjamin reminding the people that they never had a reason to fear him, that he gave them no reason to think he was anything other than a mortal man subject to all the usual infirmities of body and mind. He reminds them he had never aspired to be a king to rule over them, but had been chosen by the people. "Chosen" for what? Chosen "to serve you with all the might, mind, and strength which the Lord hath granted unto me." Benjamin recalled the fact that he had suffered quite a bit in agreeing to spend his days in the people's service, and that during all that time he had not sought any payment from them. This was not a king clothed in fine robes nor rolling in gold and silver and living in a palace. He reminded them that, unlike the ancient kings of the old world, he had never confined anyone to a dungeon, or made slaves of them, or forced them to make slaves of one another. He had never ordered anyone to murder, or plunder, or commit any manner of wickedness. He reminded them that he had labored with his own hands for his support and the support of his family, so that he would be able to serve the people without loading them down with taxes to support his own lifestyle. 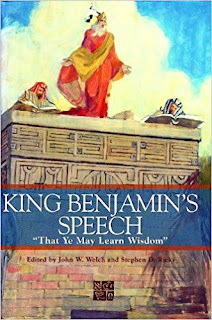 What was King Benjamin getting at? Was he boasting about what a great guy he was? No, he was not. He was trying to get across the simple message that if you want to serve God, the way you do that is by serving your fellow man. That's the only way you can serve God; there is no other way. You don't have anything Jesus wants that you can give him or trade him for. You dedicate yourself to Christ by dedicating yourself to the service of others. It's the only thing you can do, and the only thing He really wants out of you. When my wife and I lived in Sacramento, circumstances were such that we simply didn't have much money to impart to others. I didn't leave home very often because my wife is an invalid who requires my frequent care. Anytime I had to go out to get groceries or something, I would have to slip out during the four hours or so in the morning after Connie went back to asleep, because the minute she woke up I would be needed again. So I tried something. I asked God that whenever I was out running some errand, if he knew someone I was in a position to lend a hand to, would he please place that person in my path? Well, it turns out that there are a lot of people in need of rescuing to some degree or another. God started placing people in my path who were stranded and needed a ride, or who were hungry, and even some who desperately needed a place to sleep for a few hours. Over the lifetime of my marriage, I've brought home a lot of strangers for my wife to meet. 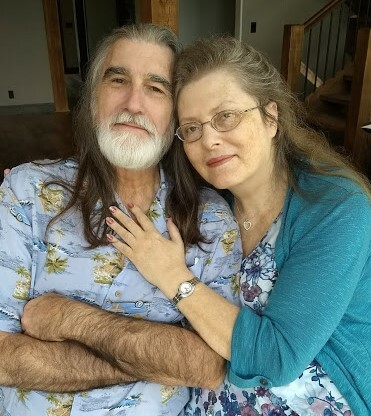 The first time this happened, it was when we lived in Utah and I rescued an exhausted guy struggling to make it through a blizzard at Point of the Mountain at 3 a.m. Connie was quite alarmed that time, but since then she has learned to trust the Lord's judgment. On one extremely hot summer day Connie and I were in the car together and brought home an entire family from out of state that was stranded by the freeway. We kept them with us for several days, becoming fast friends in the process. God constantly found ways to use me as His angel. I recall one instance when I pulled into a thrift store parking lot and was flagged down by a young woman standing by her car. She chose me because I was driving the same make of car as hers, and bless her heart, for some reason she thought the key to one Ford Taurus could be used to unlock any other Ford Taurus. She had inadvertently locked her car with the engine running, and her child was still inside the car. This young Hispanic mother was in a near panic; she didn't know what to do. She was understandably reluctant to call the police for help, because in her experience with police in that city, she felt she might be arrested for child endangerment and lose custody of her child. That was my experience with cops in Sacramento as well; in fact a Sacramento County Sheriff's deputy I had become friends with (a man who did not think highly of the Sacramento city cops), told me in disgust that when police in Sacramento respond to a call, they only want to know one thing: "Who do I get to arrest?" Well, as luck would have it, I happened to have recently become acquainted with a tow truck driver whose shop was just around the corner from where this thrift shop was located, so I called him and he came out with his nifty burglar tools and got this woman's car door unlocked. When I explained the circumstances while I paid him, he gave me a massive discount. But the point I wanted to make is this: in every case where I played Lone Ranger to persons I stumbled across in distress, something always passed between us that went far beyond a simple act of kindness. There was always a perceptible meeting of the soul, of two hearts recognizing each other as something more than simply strangers having a chance encounter. It's more like -how can I put this- eternal acquaintances meeting at long last. It's a pretty nice feeling. Joseph Smith was not intended to be the only person in those council meetings who was crowned a king. Every man in the kingdom of God was to be a king, which is to say, every one of those men was expected to provide unceasing service to everyone he came in contact with. I happen to be the king in my own home. That certainly doesn't mean I'm entitled to rule over my wife (as if she'd ever let me!) It merely means I am my wife's primary servant, which, when you come right down to it, means I am Connie's butler. I am literally at her beck and call, and I am delighted at the change this role has wrought in me. I'll tell you how that works. For more than twenty-five years my wife has been seriously disabled to the point where she can do little for herself. She requires my constant attentions. Happily, Connie is not paralyzed, she can hobble around with the help of a walker and be transported to medical appointments in her wheelchair. But a lot of the time her muscles give out on her, and she is in constant agony, despite having access to pain medications. *I don't keep another woman in the kitchen. All this is by way of explaining that God has given me a wonderful opportunity to learn to serve, something I was not keen on learning when all this began all those years ago. I had been the general manager for a large hotel chain, and my star was rising just as all this was happening to Connie's health at home. She was not yet thirty years old. Either I was going to have to give all that up and stay home, or my young wife would end up living in an assisted living facility while I kept climbing the corporate ladder at work. After much soul-searching, I chose to stay home and look after my wife, and I'm ashamed to admit I resented the situation God had put me in. I resented it for quite some time. But ultimately I discovered the transcendent joy that comes from this kind of giving. I'll tell you why I think this matters. Whatever we accomplish in this life, if we fail to learn unconditional love and kindness, we'll probably have to learn it in the next life before we can progress further. What that entails is up for debate, but I'll tell you one thing I'm sure of: you don't die and get to go directly to the celestial kingdom just because your temple attendance record is top notch. If you haven't sufficiently learned true compassion while you're on the earth, you're going to end up going through some kind of additional trials until you ultimately get it right. That's what eternal progression means: you continue to progress. The final test before graduation, I believe, is whether you have the requisite capacity for kindness. Here is the best part about looking after Connie: Number one, it's easy. Number two, the rewards far outweigh the effort. Because what I get in return for my service is undying gratitude from the most remarkable woman I've ever known. That and a lot of praise. Like most husbands, I'm a sucker for compliments. Not only do I have the opportunity of being in Connie's presence day in and day out, I also have the sublime privilege of serving as her protector and personal butler. Take it all around, this is a pretty sweet gig. For the concluding chapter of this series, Click Here. So sorry about your wife's disabilities. Have you looked into CBD oil? I've heard wonderful things about it. We keep meaning to get some of that, but last I checked it was expensive. Maybe not so much anymore. A few years ago I think it was selling for 300 a bottle. I should check. Straight marijuana whether smoked or ingested just makes her head hurt worse, so we ought to try the oil. May God continue to bless you and Connie. Thank you Rock. I genuinely appreciate your comments about learning what joy can come from truly giving. We have cared for my father until he graduated, my mother in law until she graduated and continue to care for my mother. I am still working at times on being grateful as this has "cost" us financially and time wise as well. I know I still have much to learn and change. Again, I appreciate your words. You have written many great pieces, but this in my opinion, is your best. I have always been troubled about Joseph being annointed a king. Now I know why. He and Hyrum sacrificed themselves for a collection of people who were probably not worthy of that sacrifice. JESUS is the King of Kings, and now thanks to you I know that means "Servant of all servants." I wept reading your story, Rock. I also read the whole thing to my friend. Your exposition on what America was intended to be was very enlightening. I never understood all that business about being a king. Now I do. Because of you. Thank you for your message and good example. Good stuff, Rock. Please keep em coming! "The kingdom of God is in you." Had the thought that that's one way of describing a society distinguished from Rome, Israel, or any other earthly kingdom by its principle of self-government. 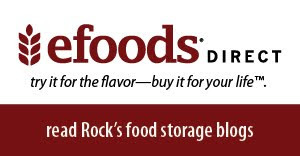 I second the previous comment about this one ranking among your best, Rock. Between this one and the one from Denver linked in it, I've had a good read. Thank you. Absolutely beautiful post, Rock! We have so bastardized the phrase "the kingdom of God" and what a king was ever meant to be (i.e., God's intention that they pattern their lives after His), that we've been unable to have any visibility into what the Lord ever intended and still intends to do. Where He is going with fulfilling the promises He made to the patriarchs long, long ago. With your (I believe accurate) description of Joseph's intentions, I think it's a lot easier to see how the world will be "revolutionized" by what the Lord will do. And when it's all materialized in this world, I really believe that no earthly mortal will be able to stand back and say: "Oh yeah--look what I did!" I think it will be abundantly clear that He has accomplished it, and that only He could have. We mortals have a horribly miserable track record, perhaps most importantly because we haven't learned the lessons you've outlined here. I think what you described is the sort of heart the Lord must be looking for. The kind of people He would like to mold. And I think those who care the most about others--even those who now consider themselves atheists, etc.--will find that the *actual* God of Heaven is far more to their liking and adoration than the false images they've been taught by false religionists for so long. Thanks for this great post. Your kindness to other people has really influenced me. I can see it through everything you write. Thank you so much. May the good Lord bless you and your wife and your family. Loved the topic and read. The kingdom of God within was told by Christ, it is the spirit of God in us as it was in Christ. As for servitude, HOW MANY will come to this conclusion, God is but a servant to us because he loves us as we MUST BE to become like him. As for your wife and yourself, you are living the dream.